This week’s tax map shows the number of hours it takes businesses across Europe to comply with the Value-Added Tax. The Value-Added Tax (VAT) is considered one of the most efficient and neutral forms of taxation. When designed with a low rate and a broad tax base, it limits economic distortions while raising sufficient tax revenue. However, complying with the VAT can be complex due to provisions such as reporting and invoice disclosure obligations, requiring businesses to devote resources to tax compliance instead of other productive activities. One way of estimating the VAT’s administrative burden is to measure the number of hours in a year it takes businesses to comply with the tax. The time to comply indicator reflects the average number of hours it takes a medium-size business per year to prepare, file, and pay VAT, as measured by PwC’s “Paying Taxes 2018” component of the “Doing Business” report from the World Bank. When comparing VAT compliance times across Europe, it is important to keep in mind that the methodology used to calculate this indicator is based on certain assumptions and simplifications, making it an approximation rather than a precise measure. 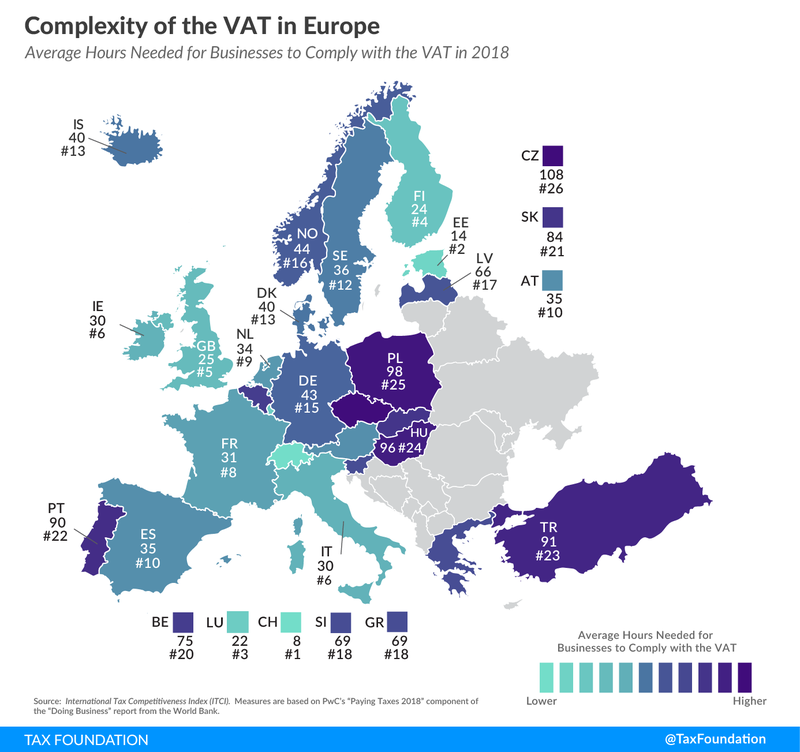 Switzerland’s VAT compliance takes the least amount of time in Europe, at eight hours, followed by 14 hours in Estonia and 22 hours in Luxembourg. In contrast, complying with the VAT requires the most amount of time in the Czech Republic (108 hours), Poland (98 hours), and Hungary (96 hours). While efficiency plays an essential role when designing tax policies, simplicity and transparency are also important. As this series on tax complexity has shown, the administrative burden put on businesses to comply with corporate, labor, and consumption taxes is relatively high in some European countries, imposing costs on businesses and the economy. These costs could be avoided or minimized through better tax administration policies or systems.